Hoodia P57 is the active ingredient in Hoodia Gordonii that's responsible for its appetite suppressing effects. Hoodia Gordoni was made popular by celebrities such as Oprah Winfrey, and also by the TV show 60 minutes that was aired on November 21, 2004. 60 Minutes aired a segment on Hoodia Gordonii, which is an increasingly popular succulent plant in southwestern Africa that's being promoted as an appetite suppressant. The 60 Minutes segment covered the issue of products showing up on the market claiming to contain Hoodia Gordinii, biopiracy (the taking of traditional knowledge without compensation) , and royalty payments to the indigenous Bushmen. Extensive media coverage and heavy marketing by supplement manufacturers that followed created a huge market demand for Hoodia Gordonii, where many products claiming to contain Hoodia do not actually contain the actual ingredient. Reviews by Alkemists Pharmaceuticals found that 60% of supplied samples contained no Hoodia. Consumer Reports investigated Hoodia Gordonii supplements on the market in 2006 and concluded that it lacks the clinical evidence to recommend this product. While there is a large consumer demand for Hoodia Gordinii diet pills, most don't know (unable to tell) the difference between cheap knock offs compared to the real Hoodia Gordonii. It becomes increasingly difficult to tell which are legitimate Hoodia products and which are not due to the numerous brand variety of Hoodia Gordonii diet pills on the market. Just to name a few, some Hoodia based diet pills include Hoodia X57, Hoodia Dex L10, Desert Burn, Hoodoba, Hoodia 750, how do you know which is real and which are just cheap knock offs? There are several things you can consider before buying Hoodia diet pills to reduce your chances of buying cheap knock offs. 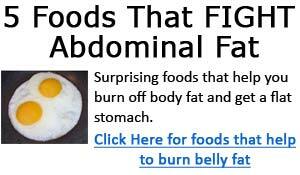 Below are some basic guidelines to consider before you decide to buy Hoodia diet pills. 1) Price - Yes, price is a factor! As consumers, we all love to hunt for bargains and good deals, but the old saying that you get what you pay for rings true here. Hoodia Gordonii is rare and expensive, where it takes around 5 to 7 years for the Hoodia to mature to provide the proper appetite suppressing qualities. So the price is a good starting point when considering a Hoodia diet pill. If it seems too good of a deal, then it probably is. There would be two basic reasons for cheap Hoodia pills: 1) either the diet pill contains no real Hoodia, or 2) it contains very low amounts of the active ingredients. 2) C.I.T.E.S. Certificate - CITES is the Convention on International Trade in Endangered Species of Wild Fauna and Flora. It is an international agreement between governments to ensure that international trade in specimens of wild animals and plants does not threaten their survival. When planning to buy Hoodia Gordonii extract products, try to look for CITES certificates. 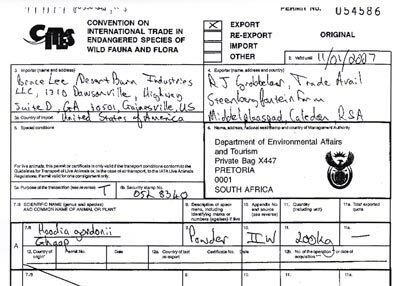 This certificate is required for Hoodia Gordinii exportation from South Africa. Usually, if the product seller has the CITES certificate, they will display them on their website. These images should be clear. If you notice blurred or blacked out areas, they could be fake certificates. Click here to see a sample CITES certificate. 3) Independent Lab Testing - Another key factor to consider before you buy Hoodia Gordonii is independent lab testing on the diet pill. Generally, the majority of Hoodia testing is done by a lab called Alkemists Pharmaceuticals located in Costa Mesa, California. They are an independent testing laboratory that does most of the testing and authentication of Hoodia Gordonii products. If a Hoodia Gordonii product has been independently tested, the lab tests will tell whether it contains real Hoodia, or it doesn't. To prove the authenticity of their products, legitimate companies will generally post images of the Independent lab test results. 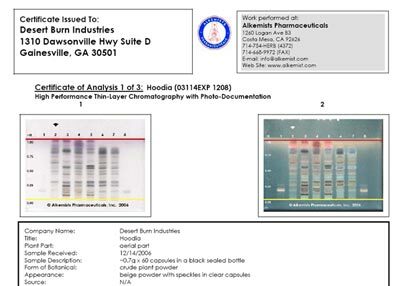 Click here to see a sample image of an independent lab test report. 4) Hoodia Gordonii Content - in general, you should look for diet pills that contain at least 400mg of Hoodia Gordonii. There are products on the market that contain much less than 400mg of Hoodia, and these are the ones you should avoid. At the higher end, there are diet products that contain 750mg of Hoodia. 5) Read the Product Label Carefully - There are two important areas to pay attention to, when reading the product label. 1) Does the label specify the part of the Hoodia Plant Used? The FDA requires the supplement companies to clearly label which part of the Hoodia Gordonii plant was used in the product. All herbal product labels should accurately identify the plant part used, usually consisting of “aerial parts” or “above-ground parts". The Hoodia Gordonii product you plan to buy should be extracted from the aerial parts (also labeled as "fingers") of the plant. If the product label does not state which part of the Hoodia plant is used, then you can be pretty sure that either the manufacturer is using sub-par ingredients, or the product contains little to no Hoodia, and the product label is not adhering to FDA's labeling requirements. 2) Does this Hoodia diet pill contain other ingredients, or just pure Hoodia Gordonii extract? There are many Hoodia Gordonii products that contain additional ingredients and stimulants such as caffeine and green tea extract. 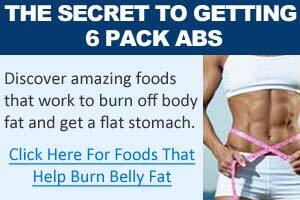 While this is not necessarily a bad thing, the only question is are these additional ingredients available in enough quantities to produce additional results? The main function of Hoodia is to suppress appetite, which leads to reduced caloric consumption leading to weight loss. So if appetite suppressing is what you're after, then going for a pure Hoodia Gordonii product with no added ingredients is a better choice. With the above 5 simple steps considered, the next time you buy Hoodia Gordonii diet pill, you should be able to make a much better decision on finding and choosing a hoodia product that contains real Hoodia Gordonii. While the above guide is not a sure-fire way to avoid buying cheap knock-offs that contain little to now Hoodia Gordonii, they do provide good starting point to consider when making a purchase of Hoodia.